PIE GM12-POD/S allows you to operate you ipod (Mini, Nano, G3, G4, G5) using the Oem satellite radio controls of your GM group radio. The GM12-POD/S provides ipod charging and full contro from the radio, allows you to maintain your factory satellite radio system, and features an additional adjustable auxiliary audio input. Individual search by Artist, Album, Playlist, Song, Composer etc..
Ability to display the following TEXT field. 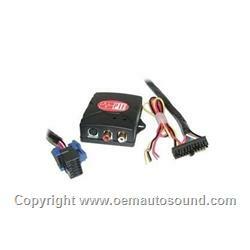 The option of using the Oem radio or iPod to control your iPod. Direct audio connection for optimal sound quality. *Must have XM radio or be XM ready radio, let us know to send you the correct cable Connects to either the head unit or XM tuner. *Works with navigation radios XM Sirius radio and rear video system. *Silver face radio with "Cat" button.